Can A Fashion Statement Provoke Change? This past Monday marked Golden Globes 75th annual show. Every year everyone gathers around their televisions to watch wins like- The Handmaid’s Tale winning ‘Best Drama Tv Series’ or Sterling K. Brown winning ‘Best Actor In A Drama Tv Series’. But this year, one of the main focuses of the show wasn’t just the awards but the Times Up’s "black attire" statement on the red carpet. Celebrities like Nina Dobrev, Sophia Bush, and Millie Bobby Brown were posting on social media about Times Up’s initiative and their intent on showing support on the red carpet. Times Up is a great continuation into the new year of the sexual harassment awareness brought on by the #MeToo campaign and Weinstein Harassments during 2017. Times Up is a movement fighting against sexual harassment and sexism in the workplace. This initiative was formed by over 300 celebrities like Shonda Rhimes, Kerry Washington, Reese Witherspoon, America Ferrera and more. Although it was formed by celebrities, the mission isn’t just to protect those in the industry. The goal of this initiative is to get a legislation to punish and hold responsible companies that condone sexual misconduct and put an end to non-disclosure agreements for abuse victims. A legal defense fund was also formed through donations to help aid and support women of all backgrounds who report sexual harassment. 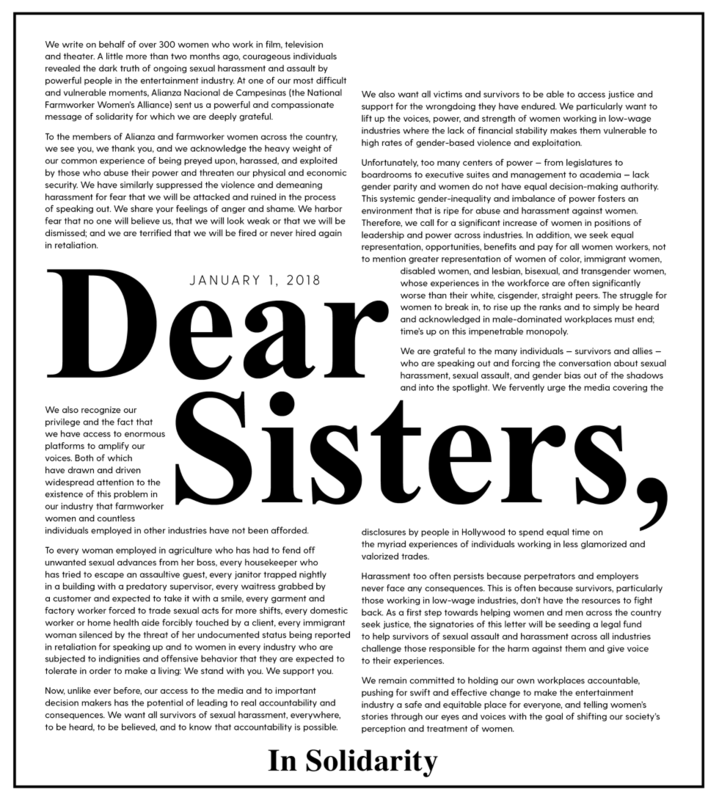 New York Times posted, on January 1st, a letter from 700,000 female farmworkers in response to and in solidarity with the women of Hollywood who are taking a stance against sexual harassment and sexism in the workplace. After the following hours of New York Times post, celebrities on all platforms were reposting and signing their names to the letter. Time’s Up also encouraged those attending the Golden Globes to wear black attire to show support and stand with their message to combat sexual misconduct and sexism. Rather than the carpet being about the best dressed, this “black attire” movement brought awareness and continued the dialogue about sexual harassment into the new year. Many are wondering whether or not Time’s Up black attire statement will influence workplace harassment. Of course wearing a black dress, taking a few photos, and going home isn’t going to do much in the grand scheme of things- but that’s not what this initiative is solely about. This wasn’t just a fashion statement but a conversation starter for the issues we must begin to seriously discuss. It’s only been little over a week and Times Up’s legal defense fund has already reached over $16 million dollars in donations. This is money that was raised with the help of the celebrities who did show solidarity by wearing black, encouraging their followers to donate, and expressing their support for the initiative. Celebrities hold a lot of influence in society, and if wearing black is what will grab everyone’s attention to listen and part-take in this movement, then it’s a brilliant idea. After all, stated by Time’s Up, “the clock has run out on sexual assault, harassment, inequality in the workplace. It’s time to do something about it”- and this right here is them doing something about it.